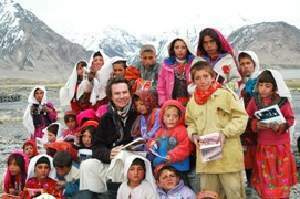 Thirteen years ago this month, Greg Mortenson, a towering American with a passion for mountaineering, found himself lost and alone in the glacial expanses of Pakistan’s Karakoram Himalaya. After failing to reach the summit of K2, the world’s second-highest peak, he wandered for weeks, emaciated and exhausted, finally staggering into the impoverished village of Korphe. Residents had never seen a foreigner, but they took him in, sharing their meager provisions and nurturing him back to health. As he recuperated, Mr. Mortenson was appalled to find children practicing multiplication tables by scratching numbers on the frosty ground with a stick. They had no paper or pencils, and the village could not afford $1 a day for a teacher. That rash pledge marks the beginning of an extraordinary transformation from climbing bum to humanitarian, richly recounted in Three Cups of Tea. To raise money, he works as an emergency-room nurse. He also mails 580 letters to politicians and celebrities, appealing for funds. That yields only one reply, a $100 check from Tom Brokaw, with a note wishing him well. Finally a $12,000 check from a wealthy scientist, Dr. Jean Hoerni, gives Mortenson hope to realize his dream. If raising money is hard, transporting building materials to the remote site brings other challenges. For three days, Mortenson rides atop a rented truck precariously loaded with lumber, hammers, saws, and tin roofing. As the driver snakes along tortuous roads, Mortenson knows that any miscalculation could send the vehicle tumbling over cliffs. When the butter-colored school with crimson trim finally takes its place among Korphe’s stone and mud huts, Mortenson refuses to stop there. As the newly appointed executive director of the Central Asia Institute, a foundation Dr. Hoerni established to fund more schools, he moves on to other Pakistani villages. He places particular emphasis on educating girls. For all students, his neutral curriculum offers an alternative to the teachings prevalent in the breeding grounds of the Taliban. Mortenson’s humanitarian instincts began early. Growing up in the shadow of Mount Kilimanjaro as the son of Lutheran missionaries, he watched his father found Tanzania’s first teaching hospital and his mother established an international school. But even those impressive accomplishments cannot compare with the hardships and danger he encounters in Pakistan. He survives fatwas issued by angry mullahs. He spends eight days in an airless room after being kidnapped by the Taliban. And he receives death threats in the United States after Sept. 11. Mortenson takes adventure to new levels as well. When a monsoon keeps the school’s concrete foundation from drying, delaying construction, he spends seven days hunting alpine ibex with village men, walking for hours over brittle ice in running shoes lined with hay for warmth. He derives the book’s title from a Baltistan proverb. “The first time you share tea with a Balti, you are a stranger,” a villager tells him. “The second time, you are an honored guest. The third time you become family.” No wonder Mortenson’s picture appears over hearths and on Jeep dashboards throughout northern Pakistan. Today, 13 years after Mortenson’s failure as a mountaineer on K2, his success as a humanitarian continues to grow. By the end of the book, he has made 27 trips to Pakistan, commuting halfway around the world with the casual air of a business traveler shuttling between Boston and New York. He has built 55 schools. Laced with drama, danger, romance, and good deeds, Mortenson’s story serves as a reminder of the power of a good idea and the strength inherent in one person’s passionate determination to persevere against enormous obstacles. Those words apply equally to the former climber himself, moving mountains, one summit at a time, as he turns stones into schools and gives thousands of children a chance for a better life. The world needs many more Greg Mortensons. Note: Greg Mortenson is the founder and director of USA nonprofit Central Asia Institute - which promotes literacy and education, especially for girls, in remote regions of Central Asia. If you buy the book through their site 7 per cent of the sale will go towards their projects. The above article was written by Babar Bhatti over at Pakistaniat.com. You can read it on that site by clicking here. Great website. Plenty of helpful info here. I'm sending it to a few friends ans also sharing in delicious. And of course, thanks to your effort!